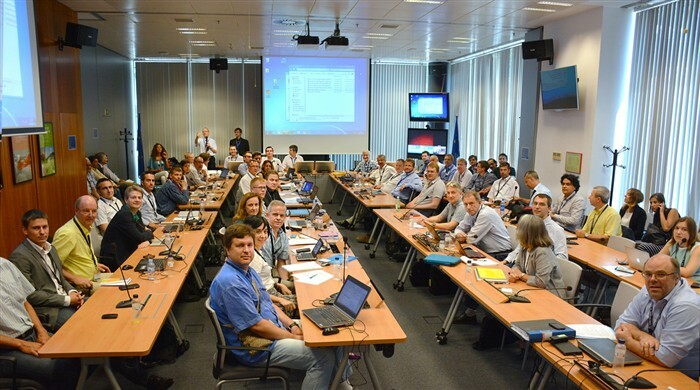 For the first time, engineers and scientists from 20 European fusion laboratories and companies from 12 different countries, colleagues from ITER IO Central Team, the US Domestic Agency, and F4E all came together for two days at the F4E Barcelona offices to discuss the progress being made on the development and integration of the ITER Diagnostic Systems currently being developed by the EU. The diagnostics on ITER will monitor the plasma during the operation of machine. F4E is responsible for contributing with 11 Diagnostic Systems (which corresponds to approximately 25% of the ITER Diagnostics Set) and works in collaboration with several large design teams made up of engineers and scientists from the European fusion laboratories and companies in order to develop and integrate the diagnostic systems. Each design team was represented at the meeting. After a welcome introduction from Pietro Barabaschi, F4E Acting Director, the workshop was organised into a number of blocks addressing topics such as technical progress, project and contract management, systems engineering and management of requirements, the design review process, prototyping and testing, and port integration. Presentations by the fusion laboratories and companies were the core of the workshop, complemented by specific presentations by the ITER IO Central Team, the US Domestic Agency, and F4E. At the end of most presentation blocks, moderated discussion sessions identified good practices, issues and synergies, which proved to be very useful for drawing conclusions from the workshop. The presentations at the workshop demonstrated the capabilities of the design teams, all of which are moving full steam ahead with the diagnostic development for ITER. The workshop proved to be a good forum for fostering closer collaboration and exchanging good practices. One of the positive outcomes is that, on the basis of feedback received during the workshop, F4E is taking action to streamline a number of contractual aspects and improve further decision-taking and the information flow within an integrated team approach. Given the outcome and positive feedback received, future similar workshops are currently being planned.